I use Kde activities a lot and I want a simple plasmoid which shows the current activity I’m in. I have so many activities that the activity switcher (not sure of the correct name) would be too big for me to be usable. There’s a plasmoid which it’s aimed originally aimed at showin current application name which we can install and setup so that it shows current activity. Its name it’s applicationname-plasmoid . This installation it’s aimed to your current user. It won’t make the plasmoid available for the rest of the users of your machine. From a panel. Add graphical items. Filter by ‘name’ or search for ‘Application Name’. Double click on it for adding it to the panel. Then right-click on it. Settings. 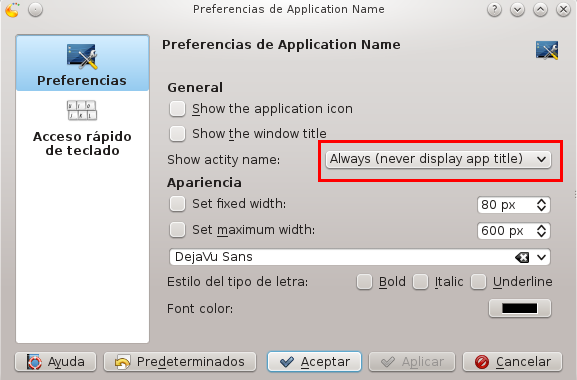 Select “Always (never display app title)” at the “Show activity name” dropdown. You can optionally set a fixed width too. Finally you just need to click on OK to save the new settings. This is one of the two components needed. It’s an auth server. Nodejs 7.x already provides it. You are currently browsing the adrian15's freedom quest blog archives for 9 febrero 2017.